Last night GameTrailers TV confirmed that Superbot Entertainment were working on Playstation All-Stars Battle Royal with the game being shown for the first time on their latest episode. Shortly after, the official Playstation Blog Youtube page added a video that provided a little bit more information and is right here for your viewing pleasure. A lot of details about the game were finally uncovered thanks to the reveal, confirming that the game does have a similar type of gameplay to that found in Nintendo’s Super Smash Bros. titles, in that the game will be played from a 2.5D perspective with 4 player battles. As you would also expect from a game with this type of gameplay it will also feature online multiplayer, as of course this could be where the game could shine the most, even though the local play will no doubt still become very popular if Nintendo’s title is any example to go by. On top of that the game will run at 60 frame per second, providing a smooth gameplay experience, something that is a huge benefit to a face paced game that has a lot happening at once on screen just as Playstation All-Stars Battle Royal does. To confirm a lot of peoples hopes too, the game will also feature third-party characters as well as first-party, including a lot of fan favorites for the first-party characters. 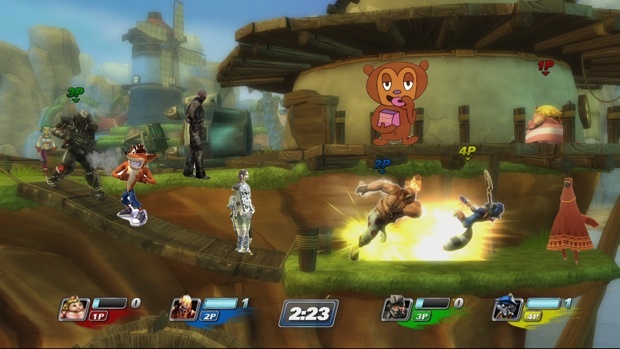 Characters such as Kratos, Parappa the Rapper, Sly Cooper, Sweet Tooth and Radec will be making their way to the fight. No exact date has been confirmed yet, but the game is expected to release around the holidays this year.